Whilst the political victors have certainly rewritten history. the legacies of apartheid in South Africa can only be understood by making sense of the complexities of the past. This includes recognising what those who were young during the apartheid era – and who are now the elders and leaders of our society – experienced during that time. Military conscription was key in the apartheid state’s “total response” to what was construed as a “total onslaught” by the perceived threats of communism and African nationalism. The state tried to draw white society into supporting this campaign by invoking a generations-long tradition of men doing military service to protect their country, values, and families. The end of apartheid meant this was the last generation of white South African and South West African (now Namibian) families to send their young men off to war in such large numbers. The very different dynamics of contemporary South Africa make it hard to understand the scale of pressure these young men experienced at home, in many churches and in most social and political domains. White South African society was politically conservative and deeply invested in protecting its interests. Democratic notions such as freedom of choice were almost unheard of. Calls for duty and service were paramount. 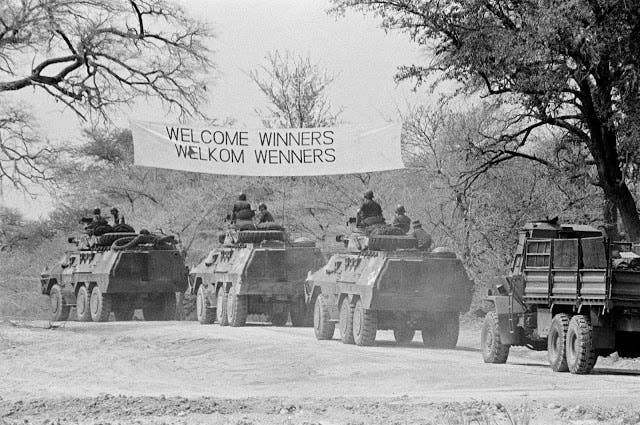 A message of support upon the withdrawal of SADF forces from southern Angola, ending Operation Packer, 30 August 1988. Those who accepted the call-up received rigorous military training, followed by deployment in South Africa, Namibia or Angola for the rest of their period of service. After that came several years of annual short-term “camps”. Over the 25 years, that conscription was in place, service increased from nine months to a total of 720 days including camps. Military combat was rare until 1975 when the SADF invaded Angola after its Portuguese colonial government collapsed. This initiated 14 years of what became known as the “Border War”, consisting of intense military and guerrilla warfare in northern Namibia and southern Angola. 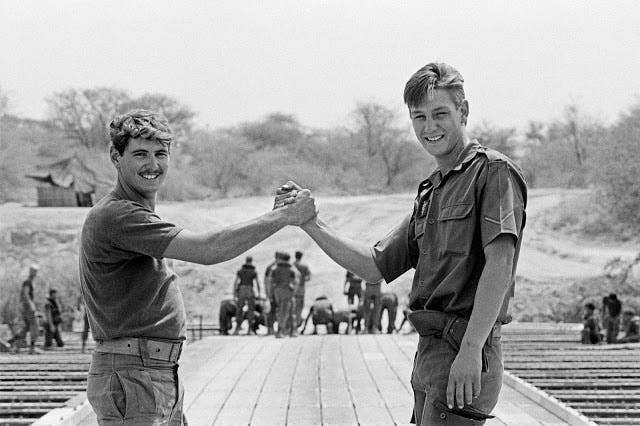 The last photograph of two SADF soldiers, veterans of battles in south-east Angola. Moments later the pontoon bridge over the Kavango River would be dismantled. The occupation by the SADF was over 30 August 1988. There have been some efforts by the public and civil society to recognise the complexities of conscripts’ experiences, being both victims of a system and perpetrators in its name. The Truth and Reconciliation Commission held a special hearing on conscription. Increasing numbers of books about and by conscripts have been published. And several groups such as veterans, some NGOs and the Legacy of Apartheid Wars Project at Rhodes University have done some work on the issue, mostly in the form of research, public dialogues and workshops to address issues of woundedness and trauma – for conscripts and those who fought against apartheid. As the more complex dimensions of our apartheid history begin to emerge, the healing and transformative possibilities of stories about conscription surfacing in the public domain should not be underestimated.